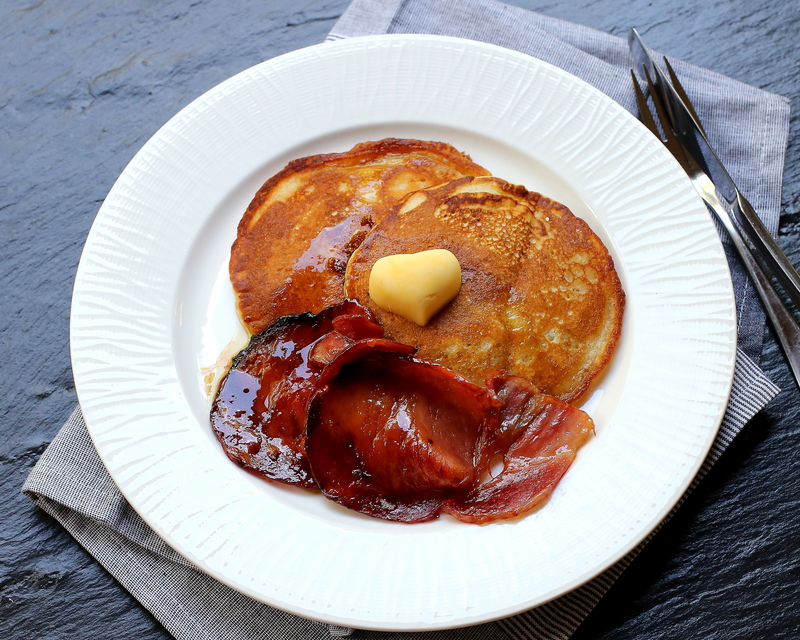 What better way to celebrate Canada Day (1 July) than with hot fluffy pancakes served with maple syrup glazed bacon, maple syrup and butter. I have to confess I can’t vouch for this dish personally. I don’t eat meat of any sort, and haven’t for a really long time, so I’ve never eaten it. However the animal-eaters in the family are always excited when I make it and pout when the bacon is all gone; so that’s high praise indeed! They tell me maple syrup glazed bacon is sweet, salty, sticky, crispy and bacon-y. The five year old tells me it’s delicious and doesn’t understand why I won’t eat. My husband agrees. I should recommend the movie Babe and the book Eating Animals respectively but that might get too controversial. This is the first, and most likely the last, time meat will be featured on this blog! 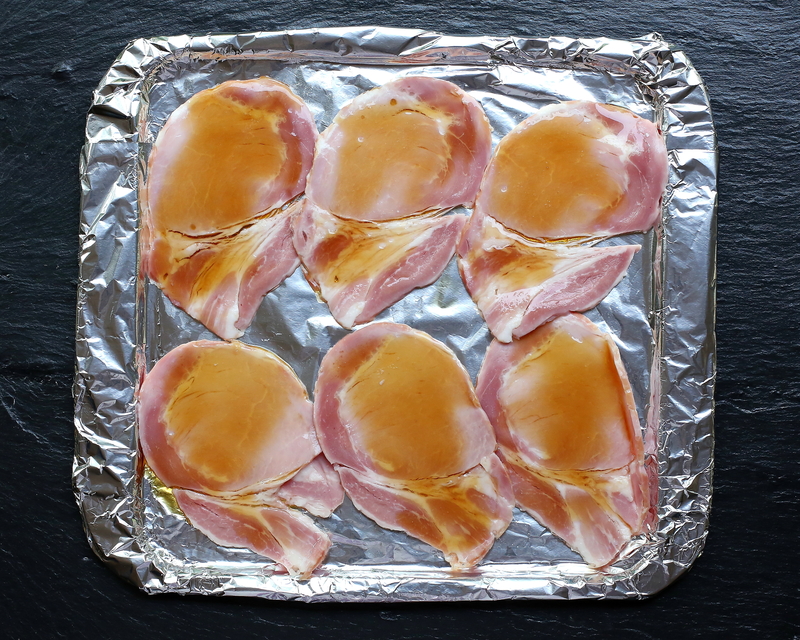 Line a baking tray with foil, place the bacon on the tray and spoon over a large spoonful of maple syrup. Place under the grill (broiler) until crispy. Turn over, spoon over a little more maple syrup, and cook until that side is golden and crispy too. The bacon takes slightly longer to cook than the pancakes. I usually make pancakes as a Sunday morning treat. I am not a morning person and I find using complicated gadgets like measuring cups a bit beyond me at that time of day so I make the batter the night before. 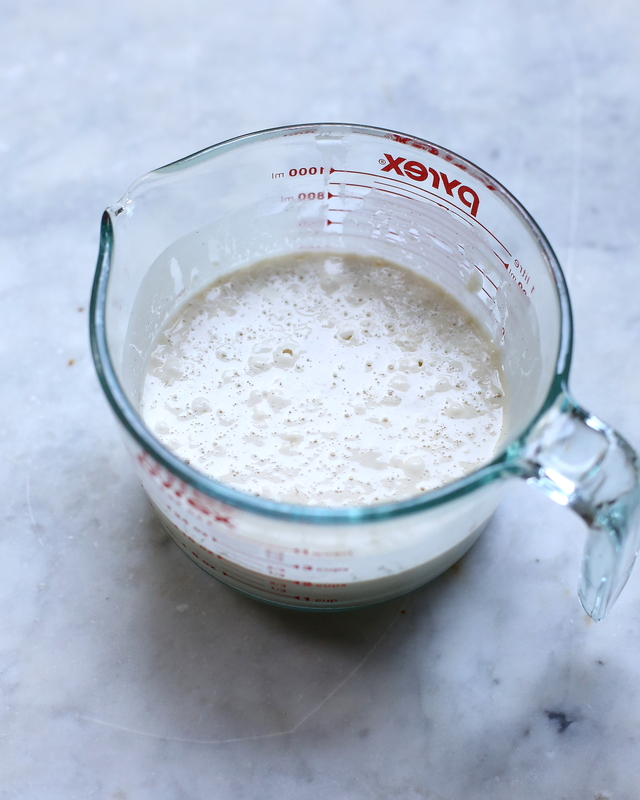 I mix the ingredients – all except for the baking powder – in a large pyrex jug and place it in the fridge. In the morning I remove the batter from the fridge and stir in the baking powder. By the time I have made coffee, collected the newspaper and heated the frypans the batter is ready to be cooked. I use two frypans to cook the pancakes. Usually I will go to great lengths to avoid any extra washing up but in this situation washing an extra frypan takes considerably less time than cooking the pancakes one by one. While my frypans are non stick I do use a generous amount of oil – preferably rice bran oil – to achieve a crisp exterior. With the batter in a large jug it is easy to pour the batter straight into the pan. By pouring in a single steady stream the batter pools in the pan into a nice round shape. This is far easier, and less messy, than trying to use a ladle. Once the batter bubbles and is visibly brown around the lower edges it is ready to be flipped. The second side usually doesn’t take as long to cook. I add a little more oil to the frypan between each pancake. *I used Orgran Egg Replacer. It is ideal to use in recipes which only require one egg, such as pancakes, waffles and muffins and is convenient to keep in the pantry. Serve the bacon and pancakes with extra maple syrup and some butter. Posted in PancakesTagged bacon, brunch, Canada, Canada Day, Eating Animals, food, food photography, maple syrupBookmark the permalink.